Teaching preschoolers about the Bible can be very fun with this Bible time idea. Preschoolers love colors and are in the process of learning all the names of colors. This idea will help your little ones learn red, green, purple and so on by hearing some great Scriptures that contain these great colors. For this Preschool Bible lesson, you will need a shoebox with a lid and pieces of material in the following colors: Red, Blue, Black, White, Gold, Purple, Green, and Silver. It will be best if the pieces are about 6″x12″ and that they are of a material that does not fray, such as netting or felt. Tie all of the pieces of material, end to end. It does not matter what order they are in. Take the shoebox and on the inside, attach one end of the long “rope” of colors securely to the bottom. Perhaps you could use very strong tape or staple it. Just make sure it is secure. Now on one end of the box, cut a circle out so that the long “rope” can easily be pulled out for all of the colors to eventually show. Stuff all of the material back into the box and attach the lid so that it will not come off easily. In jumbled order, read these Scriptures one at a time. 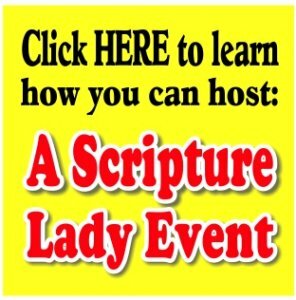 After each Scripture is read, a child is given the chance to pull the “rope” of colors out of the box until they find the color that was mentioned in the Scripture. Give them much praise when they do so. 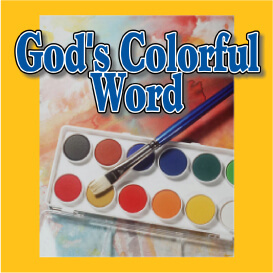 Isn’t it great to know that God’s Word can also be your child’s curriculum for learning even the basic colors?